At senior care facilities, meeting the needs of seniors comes with the job. However, at Rosewood, we like to go above and beyond for our residents, providing more than physical or mental care. At Rosewood, we can guarantee the best physical, psychological, and spiritual care for each and every resident. Did you know that there are health benefits associated with seniors who claim to be religious? These individuals have a deeper understanding of the most commonly asked question: why? Why do bad things happen to good people? Why is the world filled with so much hate? While the answers may be unknown, it is their faith and conviction which allow them to find peace and hope. 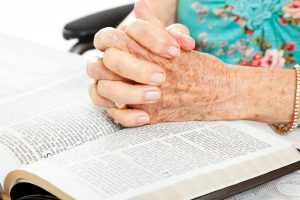 A staggering 90% of seniors report they relied heavily on their faith during troublesome times. Those who did were reported to have a faster recovery time, as opposed to others who did not. Sixty-seven percent of seniors said that having a rich life filled with religious value has added immense happiness to their lives. Living in a senior retirement community among others who relate to religious convictions can further excel happiness and growth, and that is what we’re about at The Rosewood at Fort Oglethorpe – giving the best opportunities to our senior community. Whether it takes place in inspirational group activities, outings, services, worship, or prayer, religion is vital to the happiness of our Rosewood resident community. If you’re looking for a senior living community to meet your religious needs, take a visit through our facility and spend the day becoming acquainted with our staff and residents. To get the full experience, participate at one of our events! With Easter rapidly approaching, just weeks away, we encourage our fellow Christian residents and staff to take this time to reflect and smile on the reason for the season.